I’ve been emotionally compromised. I couldn’t stop thinking about Interstellar days after I’d watched it, and I’ve had to rationalize my prolonged teary-eyed state as distress over more mundane concerns (paying my annual income tax, for example), when in reality, I wanted to weep for Cooper. My husband got a copy of the movie because he liked it but felt he needed another go to fully absorb the story. His brains apparently fell off a cliff midway. That was fair warning that I needed to watch the film in an isolation chamber for comprehension purposes. That’s just what I’d expect from Christopher Nolan whose films are beautifully crafted marvels that require audiences to take anti-inflammatory medication. If all you remember of high school physics is your teacher’s superb skills in making you cry, then the movie’s dialogue, liberally seasoned with discussions about singularities, wormholes, relativity, gravitational waves and time dilation will leave you feeling like a fart capsule exploded in your brain. The only way to connect with the story is to pare down some of its mind numbing concepts. The earth and the human race are about to go kaput. Cooper, a former pilot, is recruited by NASA’s professor Brand to take a ship with a group of scientists, including Brand’s daughter Amelia, into a wormhole to gather data from three possibly habitable planets orbiting a black hole. Brand reveals he is working on an equation that will allow them to launch space stations that’ll take humanity to a new home. In the event that this fails, Brand’s plan B is to use frozen embryos, which the scientists take with them, to jumpstart the human race. Cooper leaves behind his broken hearted 10 year old daughter, Murph, but is determined to one day return. It is later revealed that Brand lied about there being a plan A, having secretly solved his equation and deemed plan A to be impossible. From the start Brand intended Cooper and company to execute plan B with no hope of ever returning. While in the black hole, Cooper finds himself in a five-dimensional area compressed into a three-dimensional space from where he transmits data to an adult Murph. She uses the data to solve the equation that will allow mankind to launch space stations, thereby saving it from extinction. Cooper exits the blackhole and is back where he started. He is later reunited with Murph, but because of time dilation, Cooper has hardly aged, while Murph is now elderly and dying. 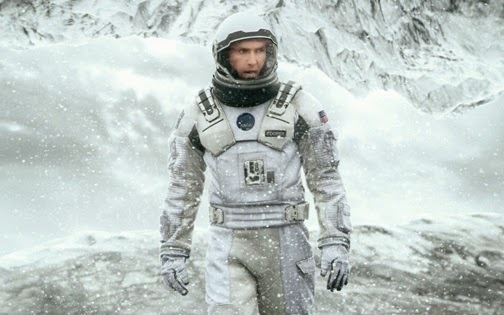 You don’t need a PhD in constipated Hollywood plots to be able to relate to Interstellar. Nolan’s message is simple. Unfortunately, this is also where the story goes a little wishy washy. After all that convoluted mental acrobatics, all Nolan wants to say is: Love is that all mysterious force that binds us, draws us together across time and space and conquers all. In the end, Nolan takes us back to the inexplicable. I don’t begrudge Nolan though, because he reminds us that we don’t always need rigid proof to experience something powerful, real, true and comprehensible. Matthew Mcconaughey portrays Cooper as your average Joe which makes it even easier for us to stand in his shoes. If you’ve ever loved another being with fierce depth, you will understand Cooper’s despair at parting and his anguish at later realizing that he has missed irreplaceable years in his child’s life. For countless Filipinos the world over, Cooper’s experience should resonate on an even more personal level. We have, after all, our OFWs who, because of love, must part for prolonged periods of time from the people they care for. So is Interstellar really just a touchy feely movie masquerading as an abstruse pop quiz in astrophysics? If the story strikes a chord with you, I don’t think you’ll bother analyzing what it is or is not. Just for laughs, here's Interstellar's Honest Trailer . "Interstellar" is a breathtaking adventure that will make you think about it for days and weeks to come. It may fall short in places such as scientific accuracy, but I believe that everyone involved in the production of "Interstellar" did their best to create a great memorable movie. I highly recommend this movie, especially in high definition.